The males have big mandibles and are larger than the females. The name of the species is due to the resemblance of the male’s mandibles to the horns of a stag and to the fact that they are used in combat between males, as deers are doing. It is widespread across Europe; in Italy it is mainly distributed in northern and central regions. 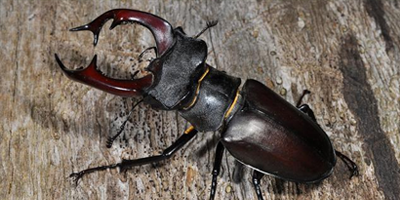 The stag beetle is associated with a range of trees, including first of all oaks, but also lindens, beech, willows, ash, black poplar, wild cherry. The larvae feed on rotting wood in different conditions: tree stumps, old trees, rotting fence posts, compost heaps and leaf mould. The major threat is the loss of habitat, due to the simplification of the forest ecosystem, removing dead wood (both standing and laying), cuttiing the old trees with dead rotten parts, compacting and deteriorating the leaf mould during forest management. Probably, also the high number of wild boars in the forests is a threat for the larvae living also in the litter. In the site IT4070011 Vena del Gesso Romagnola it is present in every area. In all the areas of the site we will maintain and improve forest structure and composition, creating and leaving dead wood, both standing and laying, increasing the structure of the forest and, consequentely, the composition of the leaf mould, creating fences to avoid the presence of wild boars. Moreover, we will breed this species ex-situ, to help its presence by artificial re-stocking.